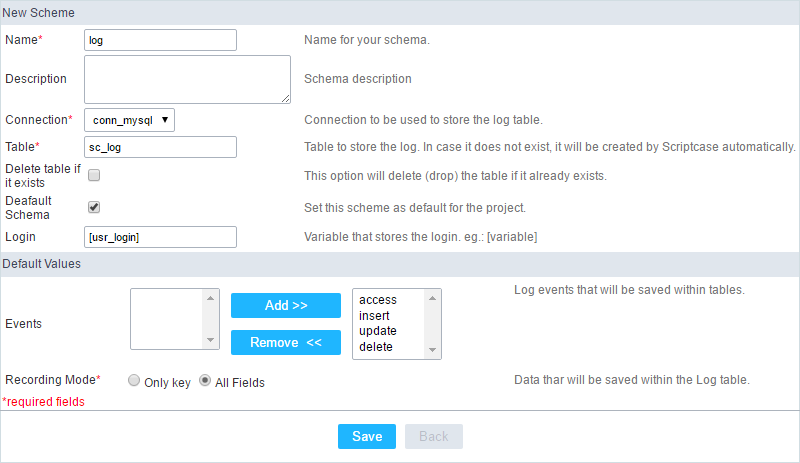 Using the log module, you can create multiple log schemas, each project application can be linked to a different log schema, which will be configured individually. Each project can have one or more log schemes applied to its applications. Access the menu Modules > Log and chick Create / Edit Log Module. If you are creating your first log schema project, proceed direct to step three, for the schema Creation/editing. It lists all log schemes previously created. On this screen, we can manage the schemas created. Edit Applications - Edits the relation between the applications and the schemes. 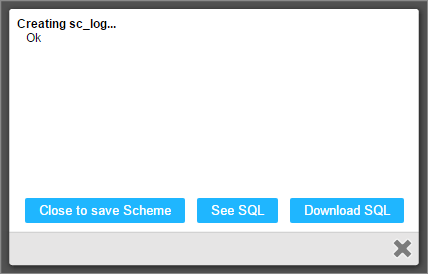 New scheme - Creates a new Log scheme in the project. Create Application Log - Creates a report using the log table, that is also used by the project’s default scheme. Edit Scheme Icon - Edits the Log scheme. Delete Scheme Icon - Deletes the Log scheme. Access the menu Modules > Log and check Create / Edit Log Module. Name - Log schema name that will be created. It is a mandatory field. Description - Short description for the new schema. Connection - Connection on where the log table will be created. It is a mandatory field. Table - Table name on where the log information will be stored. It is a mandatory field. Existing Table - This option deletes the table that has the same name in the database and create a new one. If you want to use the existing table to store the log data just leave this option unchecked. Default Schema - It sets the schema that is being created as the default one for project. Login - Global variable used to store the logged user information into the system. This variable must be the same used in the Security Module. By default, Scriptcase sets this variable on both modules as [usr_login]. Events - Actions that will be stored in the log table. Storage mode - User data that will be stored in the log table. A confirmation screen will appear when you save, just click Close to leave and save the schema. Close to save the schema - Saves the schema you created, and redirects to the applications screen. See SQL - Display the SQL used by Scriptcase to create the table ‘sc_log’ that will be used to store the log events. Download SQL - This option will download the SQL used by Scriptcase to create the table ‘sc_log’. Close Icon - This option cancels the schema creation and redirects to a new schema creation. After the confirmation, you will be redirected to link the log schemas to the project applications. In this step, you must define which log schema will be used in each project application. The list of applications can be filtered by type or by log schema used. At the top, you can apply actions to all rows or you can select only one action for each row individually. Apply schema - Select the schema that will be used for the applications. (when you select a schema, the other information is filled according to what was previously configured). Store for the Log - User data that will be stored in the Log table. Access - This event stores the information every time the application is accessed. Insert - This event stores the information when inserting a record. Update - This event stores the information when updating a record. Delete - This event stores the information when deleting a record. In this report, you can see all stored information according to the schema selected during the report creation. Security - This option attaches a security profile to the log schema.